The real importance of the BJP president, Mr. Lal Krishna Advani's announcement at the recent party national executive meeting in New Delhi has gone unnoticed. The "Swaraj to Suraj Yatra" he plans to undertake is at best a political exercise to take his message of "Su-Rajya" (good governance) to the people. The means being used for this purpose has understandably lost some of its novelty and therefore, apprehensions of a muted response are not entirely misplaced. What, however, is of interest is Mr Advani's audacious attempt to co-opt Subhas Chandra Bose in the pantheon of proponents of Hindutva and make him the mascot of his Yatra. If the Yatra is successful, then not only does the BJP stand to gain electorally, but Subhash Chandra Bose will be freed from the confines of political myth-making that has reduced him to callendar lithographs which adorn living rooms in provincial Bengal and the dimly lit offices of Forward Bloc in Calcutta. In a sense, the appropriation of Subhash Chandra Bose by the BJP is a posthumous homecoming for a nationalist who believed that rashtrabhakti is a synthesis of religion and nationalism, of the spiritual and the political. In the early decades of this century, when others were looking up to Mohandas Karamchand Gandhi for inspiration, Bose was looking elsewhere for guidance: His search for a religious philosophy that would spur political activism led him to explore the teachings of Swami Vivekananda and the writings of Aurobindo Ghosh. The latter made a lasting impression on his mind, providing his political activism with a religious side. The profound Impact that Aurobindo Ghosh had on Subhash Chandra Bose is reflected in his autobiography: "In my undergraduate days, Aurobindo Ghosh was easily the most popular leader in Bengal... a mixture of spirituality and politics had given him a halo of mysticism and made his personality more fascinating to those who were religiously inclined... We felt convinced that spiritual enlightenment was necessaly for effective national service..."
It is, therefore, not surprising that he should have also been influenced by Bankim Chandra Chattergee's construction of nationalism. And like Aurobindo Ghosh, Bankim Chandra Chatterjee and Bal Gangadhar Tilak, the Indian nation for him extended beyond the geographical to the devotional plane. During his college days he discovered the wretchedness of not India but "impoverished Mother India." Curiously, his view of the other India, the one which appears so distant from Hauz Khas village and is ignored by the votaries of "globalisatlon" who derive masochistic pleasure from the rapacious behaviour of free market economics and pine for Kentucky Fried Chicken, is not different from that of the BJP. For, "the picture of real India", which Subhash Chandra Bose described as "the India of the vlllages where poverty stalks the land, men die like flies, and illiteracy is the prevailing order", is also the India which the BJP believes should receive priority over that India which revels in rejecting anything that carries the label "Made in India", including Hindu spirituality and religious philosophy. In his book, 'Brothers Against The Raj', Leonard A. Gordon writes about Bose's quest for a religious philosophy to serve as the core of nationalism and sustain his political activism: "Inner religious explorations continued to be a part of his adult life. This set him apart from the slowly growing number of atheistic socialists and communists who dotted the Indian landscape." And It was this "religious exploration" that set apart Subhash Chandra Bose from Jawaharlal Nehru for whom "this was vain quest". Although Bose scrupulously avoided publishing his faith or his quest, he remained firm in his belief that "Hinduism was an essential part of his Indianness", his Bharatiyata. In other words, he subscribed to what is now considered politically incorrect--cultural nationalism or, call It If you must by its other name, Hindutva. This did not, however, make him a bigoted Hindu, nor did It propel him towards Hindu orthodoxy. Commenting on "definite Hindu streak in Bose's dislike for Gandhi", Nirad C. Chaudhuri records in his memoirs, 'Thy Hand! Great Anarch', "He was in no sense a bigoted or even orthodox Hindu. But he had grown up in the first two decades of the twentieth century in Bengal,where, owing to the influence of Bankim Chandra Chatterjee and Swami Vivekananda, there was a fusion of religion and nationalism, so that the nationalist feeling had a pronounced Hindu complexion and Hinduism a pronounced political character". This "fusion of religion and nationalism" and Hinduism with a "pronounced political character" came into play in 1925 when during his incarceration at Mandalay prison, Bose, along with the other Bengali prisoners, organised Durga Puja on the jail premises and demanded that the expenses be borne by the authorities. 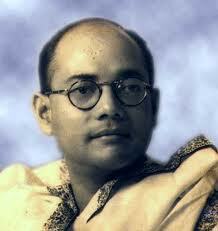 When the latter refused, Bose converted his spiritual quest into a political campaign by launching a hunger strike. This practice of political Hinduism had an electrifying impact on public opinion and soon the Swarajists lent their voice to the popular demand for the release of all political prisoners who had not been charged with a specific crime. His faith in Hinduism with "pronounced political character" which formed the core of his Indianness, is not the only reason why the BJP can legitimately stake its claim on Subhash Chandra Bose: His views on governance tally with those of the BJP, as does his definition of nationalism, "There will be a strong Central Government. Without such a Govemment," declared Bose during the War, "order and public security cannot be safeguarded..."
And all those who deride nationalism, more so cultural nationalism, as "narrow, selfish and aggressive", "a hindrance to the promotion of Internationalism", would do well to go through Bose's speech at Poona after being elected president of the Maharashtra Provincial Conference. "Indian nationalism," - Bose asserted, "Is inspired by the highest ideals of the human race, satyam (the true), shivam (the god), sundaram (the beautiful). Nationalism In India has... roused the creative faculties which for centuries had been lying dormant In our people...'. Today, a weak kneed government is scared of displaying these idioms of Indian nationalism on the television screen. Mr. Advani's yatra, however, would be a futile exercise if he fails to draw public attention to this Bose which has remained hidden from public view all these years. To "shape society and politics according to our own ideals and according to our own needs", to "abolish the entire caste system", to put "the India of the villages where poverty stalks over the land, men die like flies and illiteracy is the prevailing order" firmly back in the national agenda, to safeguard our security with a "strong Central Government", we need to rediscover the champion of cultural nationalism hidden behind the leader of the 'Azad Hind Fauj'.